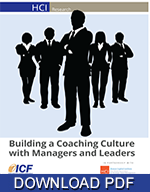 A process of facilitating awareness, building leadership skills and advancing behavioral change for managers and senior leaders, executive coaching is an integral and effective means to enhance performance to reach higher levels of leadership and organizational effectiveness. 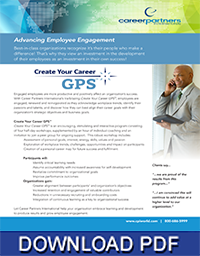 Astute organizations recognize this value and engage coaching experts to advance and develop their teams and leaders. 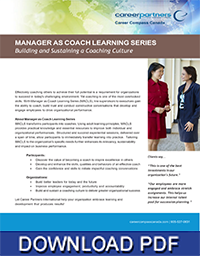 Executive coaching has now become a recognized standard for not only executives but for managers at various levels within organizations to increase productivity, leadership capacity and accelerate alignment between business strategy and professional development. 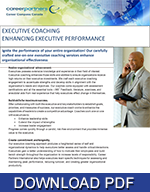 Executive coaching is hard work for both the participant and the Coach that requires commitment and detailed planning for success. Our specialized division Executive Coach Global provides excellence in leadership training and executive coaching delivered by our International Coach Federation credentialed team. Our delivery is focused on maximizing team and individual potential through commitment and having a plan of action for sustainability over the long haul. This well established financial services organization desired to assist its highest-level female executive to be even more successful in a primarily male-dominated industry. For continued career success she needed to improve her communication and partnering skills to be more effective working alongside people with whom she shared few similarities. Highly accomplished at this point in her career, the top ranking female executive of this financial services organization struggled to break through the primarily male-dominated industry to achieve her full potential and contributions to the organization. She sought a firm and executive coach who could tailor a program to her specific situation, helping her identify and develop a plan to enhance her skills. 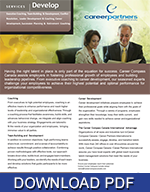 After interviewing several firms, the executive selected Career Partners International and one of its expert executive coaches. She sought a coach with extensive executive-level business experience with whom she was comfortable as a strategic thought partner. Recognizing that “it was crucial to learn how men think and act” she explained, she chose to work with a male coach. 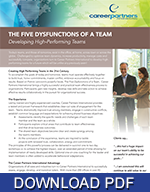 In fact, understanding the differences was instrumental in achieving new levels of success. The Career Partners International executive coach listened and tailored a program that would identify and expand upon all of the best qualities and talents the executive possessed while encouraging and developing new behaviors and skills where deficiencies existed. 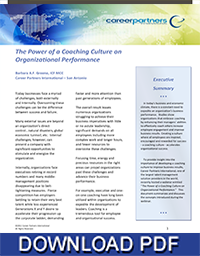 To accomplish this and create an impactful development plan, the coaching process included customized assessments. The added value came from the coach’s ability to create and implement a development plan that helped the executive effectively adapt her skills to a variety of situations. Equity investment in her business unit doubled in one year. A new line of business was added that will double her firm’s revenue base within three years. Her region achieved record revenues the first year; maximum bonuses were paid, and revenues continue to exceed targets.